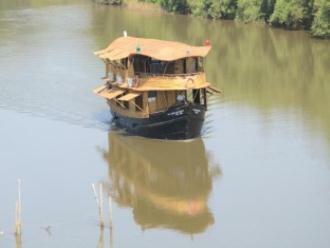 Goan Pleasure Houseboat is located at a walking distance from Panjim. It has six cabins that offer round-the-clock room services to the guests. This hotel in Goa also provides facilities such as 24 hour front desk, complementary newspaper, doctor on call service and multilingual staff to guide NRI travelers. Get fresh & hot food with the help of microwave that is available in the lobby area.